Dogs are amazing pets. They are loyal, loving and non-judgmental, which is more than I can say for most people, and the benefits of having a dog are well documented. The PDSA say that looking after a dog can keep you physically healthy, and can improve your mental well-being for example and much research have proven this. 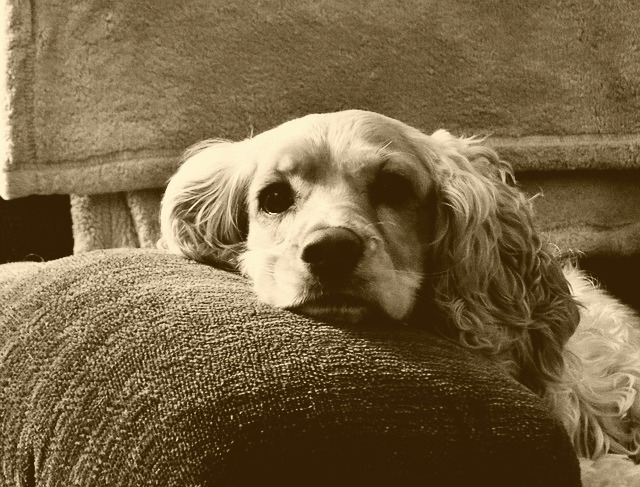 My first dog was a cocker spaniel, Rusty. I adored this little dog and I was only little when my dad told me it had run away. It broke my heart. He actually found the dog a new home, not sure why to this day he told me it had run away but that was dad logic in the 1970s! I think he was concerned that it was not getting enough exercise. It looked like this cute puppy above, but we don't have any photos of her I'm afraid. Fast forward 20 years on, and my next dog was Ben. He was a Collie cross. My ex-husband worked in an old peoples' home and one day an old lady was admitted who had no one to look after her dog. This is when my ex-husband came home and said 'I have a surprise for you' and Ben came running in. Before long we were looking after Ben permanently as the old lady needed full-time care and had to stay at the home. 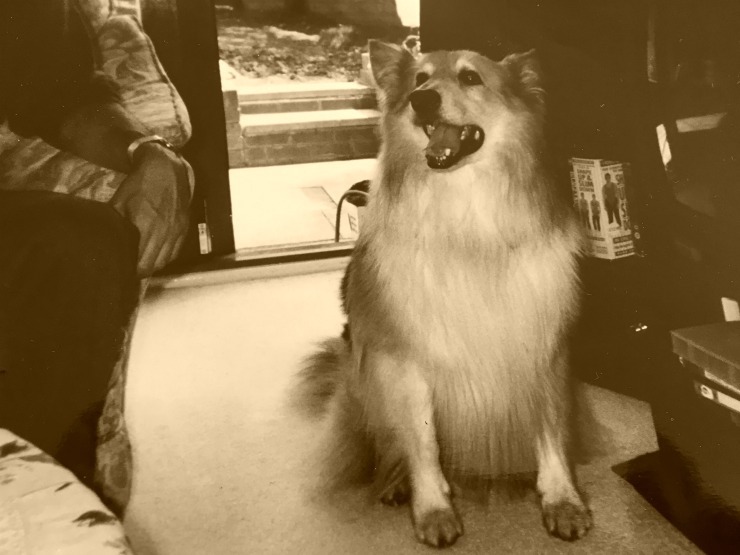 Ben was a big softy and looked like Lassie. He would come for cuddles and would put his head on my lap looking to be stroked. If I was there watching TV, he would nudge my hand so I could stoke him. He was very protective and loyal, a typical Collie. I remember walking him around the area I lived through the park and then taking him off the leash and throwing a ball for him to catch. Although Ben had lived with the old lady for a couple of years, she had found him in a dogs home and Ben was not without his behaviour problems, and sadly we think he has been hit in the past. Unfortunately, his behaviours became an issue when I had my son Jake. When Jake came along, Ben started getting jealous of any attention I gave to Jake and not him. One day when my neighbour's two-year-old child was in the house, Ben went for her and took a nip at her. Luckily she was ok but she had a red mark on her face. I was mortified and couldn't apologise enough! Of course, we couldn't take any chances when Jake was so tiny, so we asked my mother-in-law to look after Ben for a while instead. We saw Ben every week until he became ill with cancer and sadly died. Ben was a loving dog, his past, unfortunately, was a big cause of his behaviour issues. Fast forward to today and I am married to Marcus or Mr W as I call him. As we travel a lot, and Jake has been away at university for the past three years we don't have a dog, but I miss not having one. This led us to recently trying housesitting. Housesitting is where you look after someone's house, and very often their pets too when they are away. There are a number of sites you can register to do house sitting on and mostly this is an exchange of services. You look after the house and pets for free accommodation, the owners know their house is safe and they pets are fed and well looked after. It's a way to travel the world for free and also have the benefit of looking after pets too. Our first house sit was in a beautiful listed house in the Cotswolds. We were warmly welcomed by the owners who were incredibly laid back. Help yourself to the food they said! When we turned up, there was even a bottle of wine waiting for us. The dogs were brilliant too. 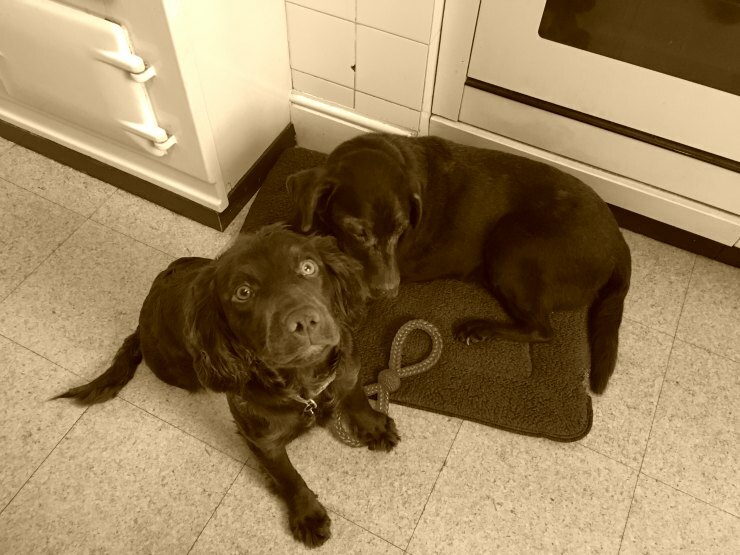 A gorgeous Sprocker spaniel called Nellie and an older chocolate labrador called Meg. Our day would involve getting up and feeding the dogs, letting them out to go to the toilet and then gave them a long walk morning and night. While we were there we toured the immediate area and saw some of the Cotswolds which is beautiful. 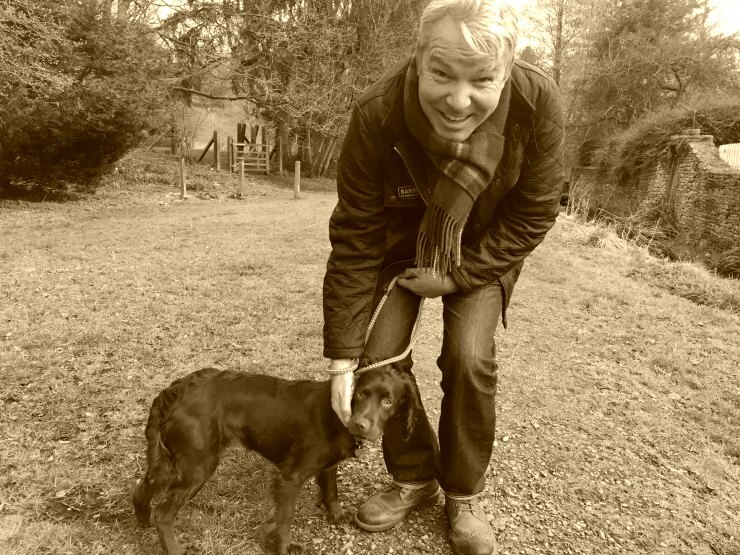 We loved looking after Meg and Nellie, however, it was not without incident, Nellie was an incredibly active dog and would chew everything in sight but we had been warned about this by her owners. 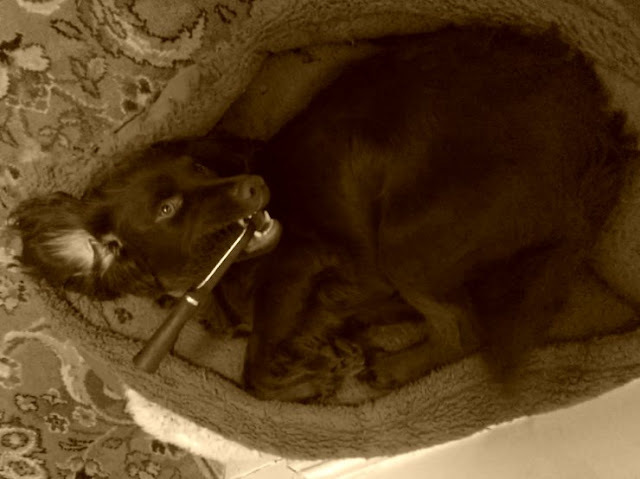 One day I was looking for my hairbrush everywhere and couldn't find it, then I saw Nellie with it in her mouth, wagging her tail! She also had a habit of wriggling under the fence in her garden, I almost had a heart attack when I thought I had lost her. Again the owner warned me she would do this but always comes back. Nellie was a right pickle! We would definitely housesit again as we loved looking after the dogs so much. You can choose which animals you are comfortable looking after. Check out Trusted Housesitters and other sites if you are considering house sitting. So this is my pet story. Petplan want to hear your Pet Stories too, so whether it is a recovery from illness or just their day to day mischief share your story on Petplan’s Facebook or Instagram using #PethoodStories and check out Petplan Pet Insurance for peace of mind. My kids are longing for a dog (and hubby is too) but at the moment we've only got guinea pigs. Housesitting and looking after the pets sounds like a great idea! This was an interesting read. We absolutely adore our dogs and I am actually thinking about changing our pet insurance as I think the amount we pay is incredibly high right now. I have also housesat dogs which we don't own and they do have different personalities. I never owned a dog as a child but look forward to owning dogs for the rest of my life. This is such and amazing idea and I suppose so much fun too. We are all longing for a dog, but unfortunately we live in a top floor flat. My partner’s mum has 3 big old working dogs that she participates in Dog Sports with...canicross etc. One of her dogs was on The Supervet tv shoe! She had 4 but recently one had to be put down as she lost all use of her back legs...she had wheels for a bit but her quality of life got so bad so they had someone come and do the deed at home, while she was being cuddled by all her family. Dogs are great companions for everyone. We have one pet, and the kids just absolutely love her to pieces.